This Wednesday’s Body Beautiful on the San Francisco Bay Area’s News Station, KRON 4, will cover both Facial Plastic Surgery procedures and Body Sculpting. One of the most frequently augmented parts of the body are the lips. Lip Augmentation with dermal fillers like Restylane, Juvederm and Perlane, offer instant gratification, minimal recovery and virtually no down-time. There is a day or two of swelling, and the volume needs to be maintained periodically, but these hyaluronic acid based fillers are softer, and last longer than the previous lip plumper: Collagen. Vermilion Advancement is a Surgical Lip Enhancement that permanently advances the red vermilion of the lip out of the mouth and onto the lips. Surgical Lip Enhancement is also an option. Dermal grafts and local tissue rearrangement can add volume and change the lip shape with longer lasting results. Unlike fillers, these procedures do require some down-time for recovery. The surgical options for Lip Enlargement with be discussed on KRON 4’s Body Beautiful this week. Otoplasty, sometimes called Ear Pinning, is a facial plastic surgery procedure that corrects prominent ears. 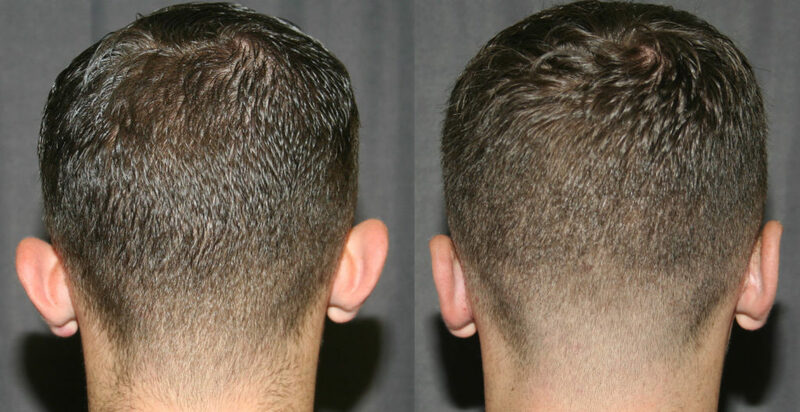 Otoplasty is the cure for prominent ears. It is one of the few Cosmetic Plastic Surgery procedures which is performed on both children and adults. Ears are usually prominent at birth. There is evidence that immediate molding, within a few days of birth, can bring the ears in closer to the head, but after a few weeks, the ear cartilage is unbending in its prominence. The ear reaches 85% of its adult size by age five, making this is a common time for Otoplasty. It is important that both the parents and the child feel the ears are too prominent. A second peak in the age of correction is in young adults. Usually, their prominent ears have been bothering them for quite some time, and as young adults, they now have the means to fix it. A common reason for Breast Implant Revision is to correct Capsular Contracture. Before, the breast implant is firm, squeezed and pushed up out of the breast by a tight capsule, leaving the breast tissue hanging. The after picture shows the improved breast shape and support. Breast Augmentation remains the most popular of all the cosmetic plastic surgery procedures. While Breast Implants can add volume to small or deflated breasts, the results can change with age. Breast Implant Revision has almost become a specialty unto itself. The reasons for revision and the methods are reviewed on my SanFranciscoBreast.com web site. Some of the most common breast revision surgeries, and the results, will be discussed this week on Body Beautiful. Gynecomastia is Male Breast Enlargement, and not in a good way. The problem can occur at any age, but is most common during puberty, and in one-third of cases, lasts a lifetime. Gynecomastia Reduction can help masculinize the chest again. Gynecomastia Reduction Surgery is one of the most common male cosmetic plastic surgery procedures. Removing disproportionate breast tissue can help smooth out the chest both in and out of clothing. I practice Plastic Surgery in the San Francisco East Bay Area city of Walnut Creek. It’s been warm here all winter, and gets hot in the summer. I know I have done a good job when my patients ditch the bulky hot sweatshirts they wear during their initial consultation, for a t-shirt after their Gynecomastia Reduction. Wearing a sweatshirt in Walnut Creek during the summer is no fun. This Wednesday, March 11, at 11 AM, host Janelle Marie and I will be discussing Lip Augmentation, Otoplasty, Breast Implant Revision Surgery and Male Breast (Gynecomastia) Reduction in the new KRON 4 studios. If you have questions about these, or any plastic surgery procedures, that you would like answered on the air, use the contact form in the margin to drop me a note. If you would like to schedule a consultation, call (925) 943-6353 to arrange a personal, in-person review of your options.